Read what's new at Pine Haven Christian Communities. 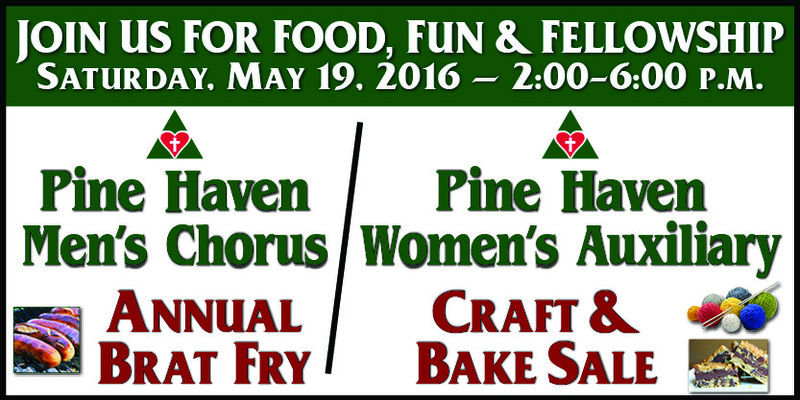 Pine Haven Men’s Chorus and Pine Haven Women’s Auxiliary will hold their annual brat fry and summer craft/bake on May 19, 2018. This event will take place one month earlier than it has in past years, giving people a taste of summer prior to the Memorial Day weekend. This event benefits the residents of Pine Haven Christian Communities, and will take place in the residential center activity room at Pine Haven’s original, Giddings Avenue Campus – at 531 Giddings Avenue in Sheboygan Falls. Brats, burgers, chicken patties, potato salad, baked beans, desserts, and beverages will be served from 2pm – 6pm. Take outs are available. Handmade crafts and baked goods will be available for sale. The Men’s Chorus, the Women’s Auxiliary, and all the staff at Pine Haven Christian Communities encourage everyone to come by to enjoy the food, crafts, and fellowship, while supporting your community. Pine Haven Women’s Auxiliary will hold a fundraiser to benefit the residents of Pine Haven Christian Communities at Pizza Ranch in Oostburg on May 16th, 2016. The event will take place from 4:30 until 8:00 pm at Pizza Ranch in Oostburg – at 944 Center Avenue. During these hours, a percentage of all sales for both eat in and carry out orders will be donated to benefit the residents of Pine Haven Christian Communities. Pine Haven Women’s Auxiliary and all the staff at Pine Haven Christian Communities encourage everyone to come by to support a local restaurant, as well as your community. Pine Haven Christian Communities’ Women’s Auxiliary will hold their annual Italian Supper to benefit the residents of Pine Haven Christian Communities will be held on April 12th, 2016. The benefit will take place at First Reformed Church in Cedar Grove, located at 237 South Main. Spaghetti and other Italian main dishes, salad, bread, desserts, and beverages will be served from 4:30pm – 7pm. All donations received will benefit the residents of Pine Haven Christian Communities. Pine Haven Women’s Auxiliary and all the staff at Pine Haven Christian Communities encourage everyone to come by to enjoy the food and fellowship, while supporting your community. Pine Haven Christian Communities will hold a dedication ceremony for their new Haven Drive campus on September 12. This event will be combined with their annual autumn festival and brat fry to benefit the residents of Pine Haven Christian Communities. The dedication ceremony will begin at 1:30 p.m. and will include performances from the Pine Haven Men’s Chorus, a short prayer, and brief words from community leaders. The event will take place in the Community Center of the new Haven Drive campus, which provides a full continuum of care for seniors, located at 220 Haven Drive in Sheboygan Falls. Attendees are encouraged to tour the new community after the ceremony. There will be entertainment and informational videos in marked locations around the campus. Immediately after the ceremony, the annual autumn festival and brat fry held by the Pine Haven Women’s Auxiliary will take place in the Community Center, running until 6 p.m. The festival will include food, entertainment, and harvest crafts. Produce, crafts, baked goods, canned items, and pies will be available for purchase – most of which are hand-crafted by members of the Women’s Auxiliary. There will also be brats, burgers, potato salad, baked beans, desserts, and beverages served from approximately 2:45 p.m. until 6 p.m. Take outs are available. All proceeds benefit the residents of Pine Haven Christian Communities. Pine Haven Women’s Auxiliary and all the staff at Pine Haven Christian Communities encourage everyone to come by to enjoy the festivities, while supporting your community. Pine Haven Christian Communities’ Women’s Auxiliary's annual Italian Supper to benefit the residents of Pine Haven Christian Communities will be held on April 21st, 2014. The benefit will take place at First Reformed Church in Cedar Grove, located at 237 South Main. Spaghetti and other Italian main dishes, salad, bread, desserts, and beverages will be served from 4:30pm – 6pm. All donations received will benefit the residents of Pine Haven Christian Communities. Pine Haven Women’s Auxiliary and all the staff at Pine Haven Christian Communities encourage everyone to come by to enjoy the food and fellowship, while supporting your community. Pine Haven Women’s Auxiliary has announced that their annual holiday craft & bake sale to benefit the residents of Pine Haven Christian Communities will be held on December 6th, 2014. The event will take place during “Main Street Memories” in Sheboygan Falls at Catalunya Restaurant, located at 124 Pine Street, from 9am – 3pm. Crafts and baked goods will be available for purchase – most of which are hand-crafted by members of the Women’s Auxiliary. All proceeds benefit the residents of Pine Haven Christian Communities. It’s a great way to get some holiday shopping done, while supporting Pine Haven and the seniors in our community.